After working on the commissioned project for a long while on my sick day, I figured I had gotten it to a point where I should be allowed to work on something new. 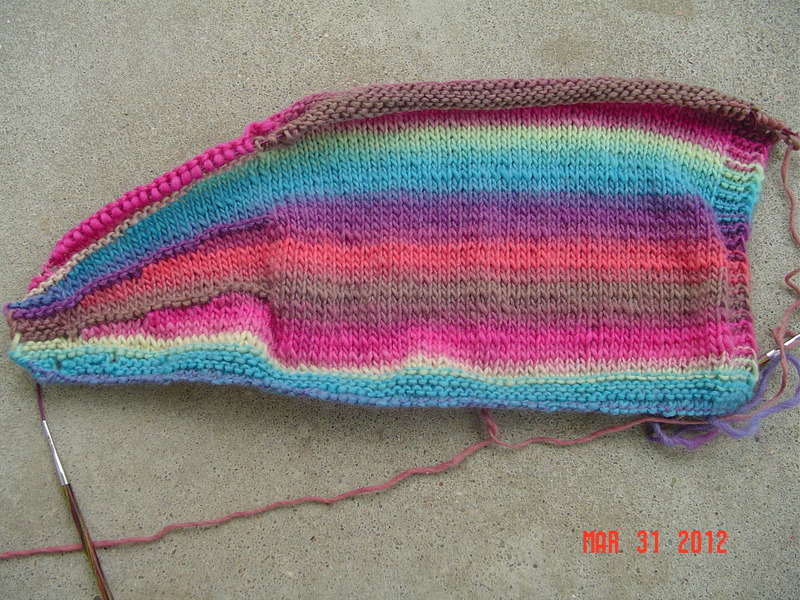 I picked up some knitpicks chroma worsted awhile back in order to make a sweater for Bug. I’ve been itching to use it since long color changes are exactly what I live for in knitting. This sweater is knit vertically rather than horizontally to make vertical stripes on the sweater. 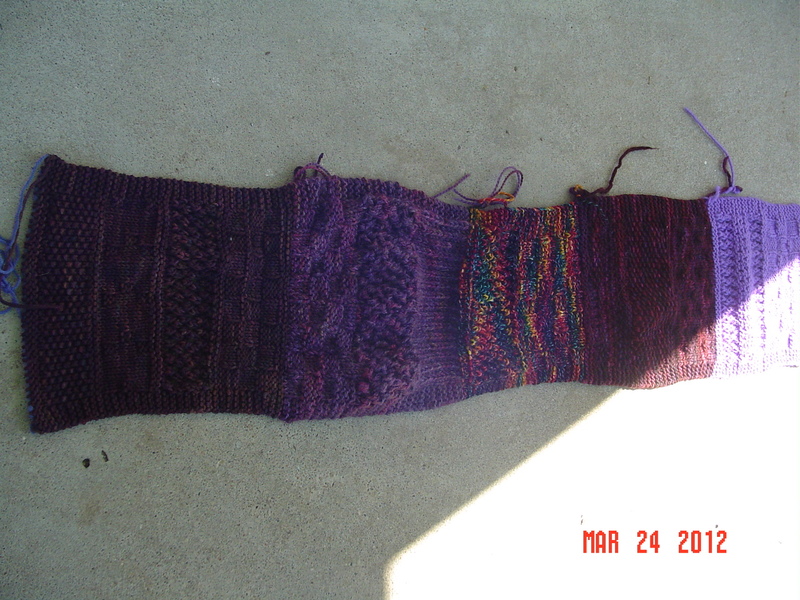 It is shaped using short rows. I think it is a fantastic knit for kids, and really wanted to get it done because the pattern only goes up to size 8 and that is what she will be this fall. 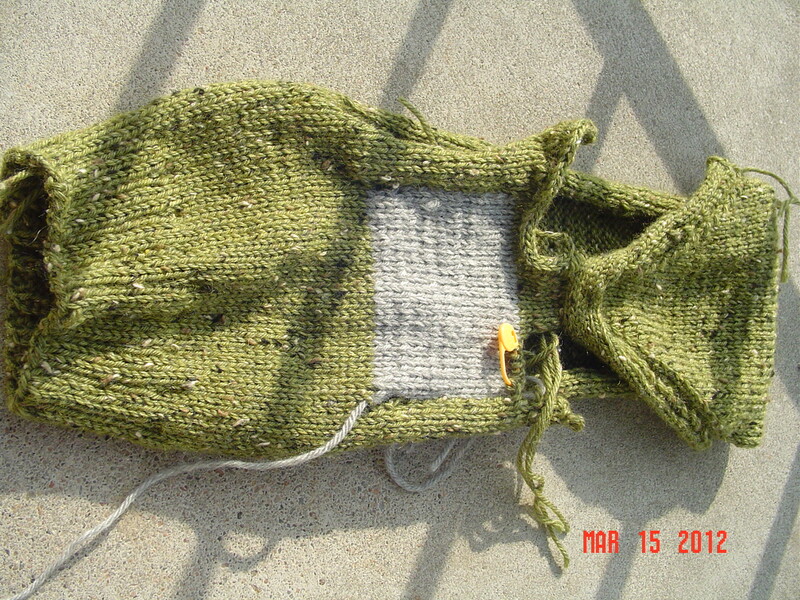 It feels like it may be a nice quick knit, at least at this point. Bug is eagerly awaiting this one, as she is as fascinated with the colors as I am. I’ve been suffering from a cold and a cough which, ultimately, is now interfering with my cycling. At least, it did so on Tuesday evening. I went on a ride, and overnight was up coughing most of the night. This meant I really needed to call in sick the next day. Between feeling miserable, the cough, and lack of sleep it really was the best decision. I did spend time catching up on sleep, but I also had the opportunity to work on the green thing that I’ve been avoiding forever. I need to remember the faster I get it done, the faster I can work on other projects. I actually finished more than I expected, I now have about 3 tasks left and I am done! It is still looking rather goofy, but it will come together quickly now. It is still traveling. I do believe it may be done in Omaha, and it may be ready to send to DC. 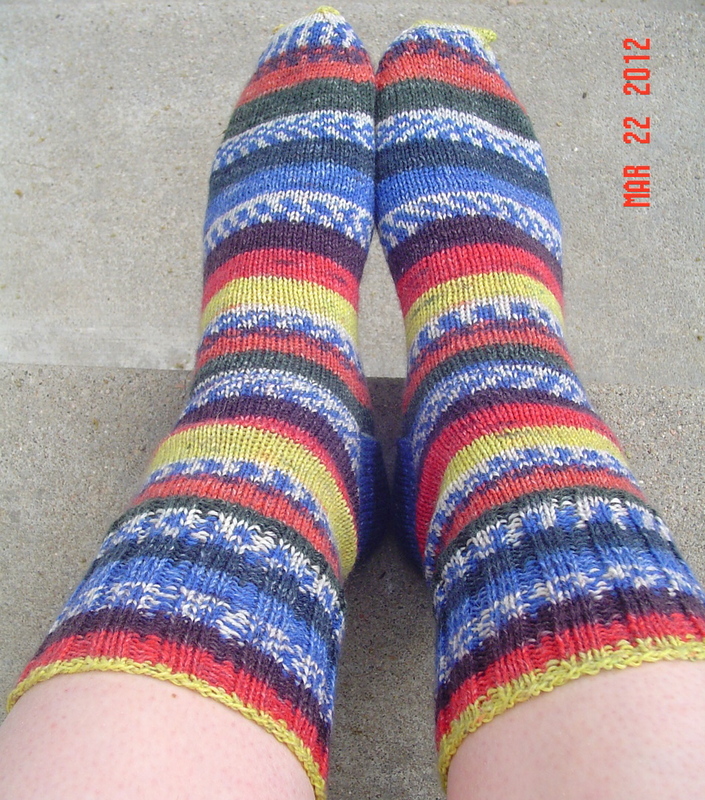 The second pair of socks this year for my mom. They are wonderfully bright and I made them match. I am pleased with them, and since she left her other pair off while trying these on and put her sneakers on immediately, so I do think they are a hit. 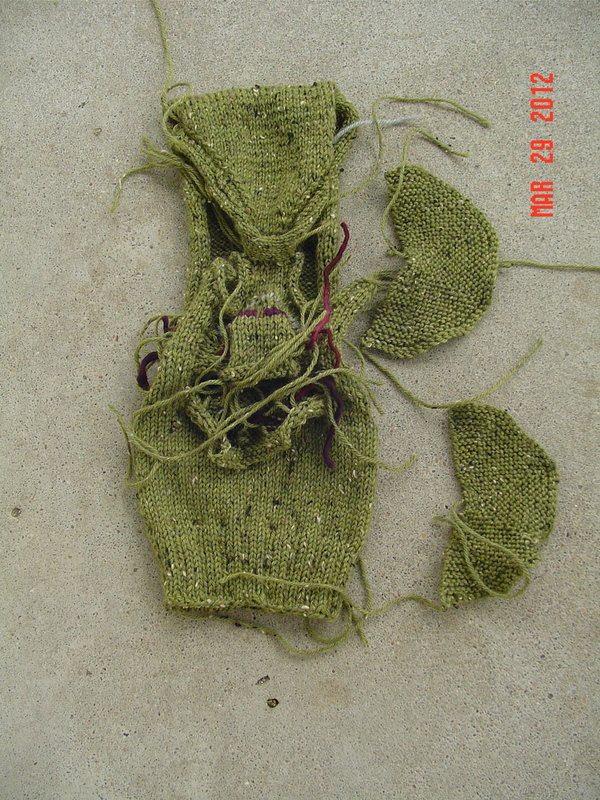 Sparkeespud, the fourth person to work on the traveling scarf, is done with her portion. I dropped by via bike (in the rain) yesterday to pick up the scarf with hopes to hand off the scarf to the next victim tonight. We certainly have a bit of a purple theme going on! Now, I am aware I’ve been slacking in the blog post department lately, but I have a decent excuse. My mom is in town, and really by the time I commute home by bike, I just want to spend a little time with her and Bug. I haven’t got a lot of content to post anyhow, thought there are certainly some new Julie Wardrobe items to show off. 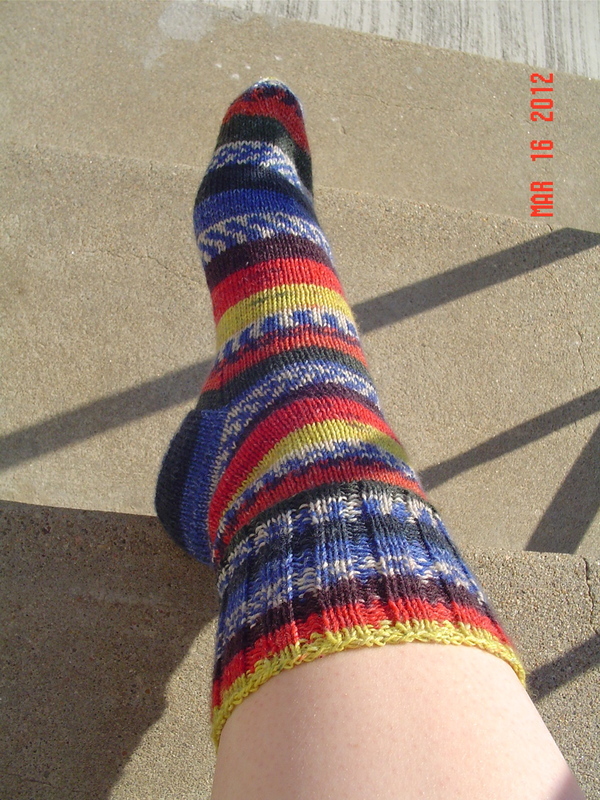 One very bright and colorful sock. One, while the second one needs to get done in a week. Yes, I’ve started the second one. I spent a good long time not understanding how this project was constructed at all. It is fantastic to realize that after all that worry, it is finally beginning to take shape. 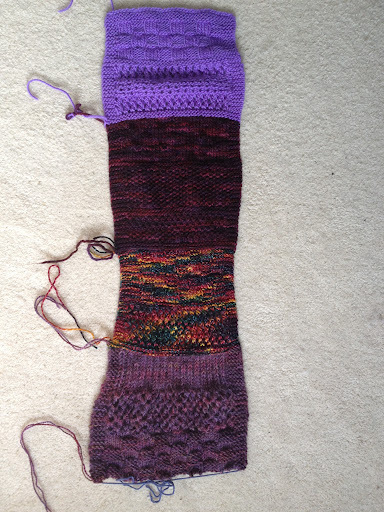 I am starting to understand what is going on, and this makes my knitting far more confident. Not only confident, but inspired. Instead of dreading working on it, I am eager to see it come together now. Yes, there is still a long way to go and so little time to apply toward it, but the time I spend on it is far less stressful.